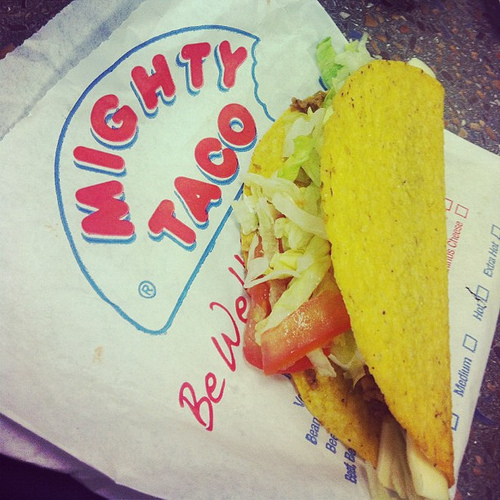 Rochester foodies were all abuzz with the coming of Buffalo favorite Mighty Taco. The news has been reporting on it's arrival for over a year. It finally opened this week so Aaron and I decided to try it out. The line was out the door! We didn't have enough time so we resorted to Chipotle (not a bad alternative mind you). Yesterday we decided to give it another go. The line was still long but at least we weren't standing outside. We had about a 15 minute wait even days after the grand opening. It was good but I can't pinpoint why. There were some surprises. The cheese in the taco was basically a Kraft single. The fajitas are more like a soft taco - filled with meat, lettuce and tomato. The roastita was more what i expected in a fajita - meat, peppers and onions. Other than that... they were just typical tacos... just really, really good tacos. These sound mighty close to the cheap tacos that they sell at Jack In the Box. I'm not a fan but my husband craves them and anytime we go west he mandates a stop at a JItB. I'll have to check and see if there are any Mighty Tacos close to us.